Join in on the Cider making craze with a super easy to make Cider Kit. Fresh strawberries coupled with juicy pear. This cider is sweet and fruity, especially good when served chilled on a hot summer's eve. 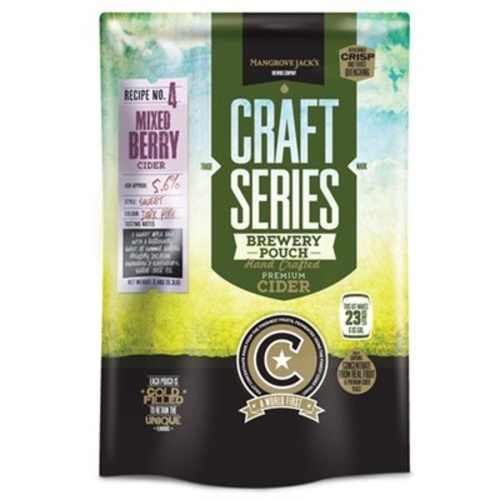 Each of our cider varieties has been formulated with only the freshest and best quality fruit which is then pressed and concentrated using state of the art evaporators, and then cold filled into a pouch. All this effort we go to ensures we preserve the natural flavor of the fruit, giving you cider which is fresh, crisp and especially good on a hot summer's day. Please Note: You will need at least 2.2 lbs of Dextrose for this kit as well. See our You Might Also Need Section below for products. These kits come with yeast, preservative, sweetener, and Cider Extract. The yeast, preservative, and sweetener can be found in a pouch inside the bag. What yeast comes with the W303 kit? BEST ANSWER: Hello Jim - I have re investigated this question. I cannot confirm the exact yeast that comes with this cider. However it seems Mangrove Jack's produces a proprietary Cider Yeast "M02". I would assume this kit comes with their yeast.